Over $600 in Cash & Prizes! 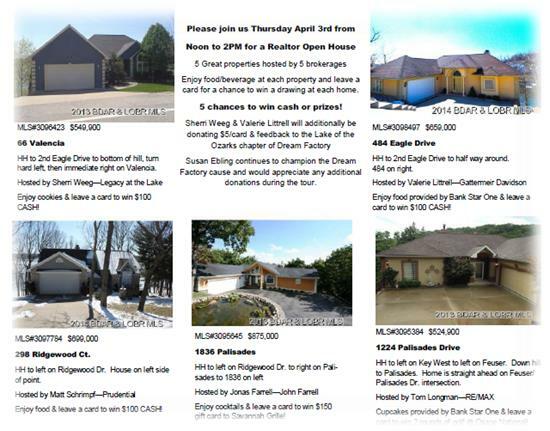 Realtor Open House - Thursday April 3, 2014 from Noon-2PM! Join us to view 5 fantastic lake front homes in Four Seasons! Leave feedback and a card for a chance to win cash or prizes at each property! Check out Lake of the Ozarks Chapter - Dream Factory on facebook below! Join Sherri & Valerie & make a donation to support a terrific local cause! Copyright © 2014 Gattermeir Davidson Real Estate All rights reserved.